Broken Hearted Toy: Post Of Christmas Past - Carl Wayne's Hipster "White Christmas"
Post Of Christmas Past - Carl Wayne's Hipster "White Christmas"
Back in the year 2000, Carl Wayne took over for Allan Clarke as the lead vocalist for The Hollies. Although the band hadn’t released an album since 1983, it still toured extensively throughout Europe. Considering that Clarke had one of the more distinctive voices in rock, whoever replaced him would be facing a huge challenge. Wayne never attempted to imitate his predecessor. As a founding member of the highly regarded English band The Move, as well as a veteran of the stage, he had the confidence to be himself. In the four years he performed with The Hollies before passing away from throat cancer, he established himself as “the people’s Hollie”— a performer who loved interacting with fans and bringing them closer to their favorite band. 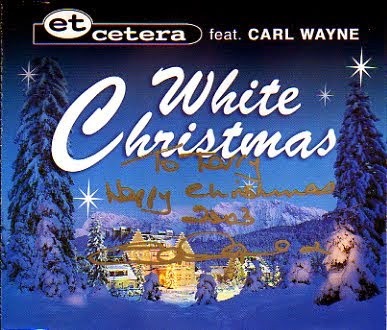 In 2003, Wayne collaborated with the German synth duo et cetera on a CD with three versions of the classic holiday song, “White Christmas.” The disc was made available through Wayne’s website, and fans could choose between an English language version or a German language version. The singer autographed each copy with a gold ink pen. The “True Feelings Mix” and the “Radio Mix” have slower, keyboards-based arrangements that showcase Wayne’s deep, soulful vocals. They’re nice, but perhaps a little too mainstream for some rock fans’ tastes. The “Swing Mix,” which features horns, finds Wayne taking a peppy, hipster approach, and it’s a lot of fun. All three versions of “White Christmas,” along with other Wayne and et cetera songs, like “Blackberry Way” and “Sorry Suzanne,” are available on iTunes. Merry Christmas, Carl and thanks for all the memories.